When you are worried about your privacy and data security, simply deleting your data before selling your iPhone won’t serve you good. Whether you are giving it to your younger sibling, or someone else, the data can still be recovered using advance tools. Well! In that case you can always look for an iPhone data eraser software and permanently delete the data. Be it photos, contacts, messages, notes, or anything else, these technologically advance programs make sure that the data has been deleted for one and all. Therefore, we are going to introduce the top iPhone data eraser software to help you get rid of all the data on your iPhone before handing over it to someone else. There are a wide range of iPhone data eraser software programs that effectively delete your iPhone data. You need to be careful while picking one for your iPhone. Here is the list of top 10 iPhone data eraser software to make your job easy. Let’s read on! Well! 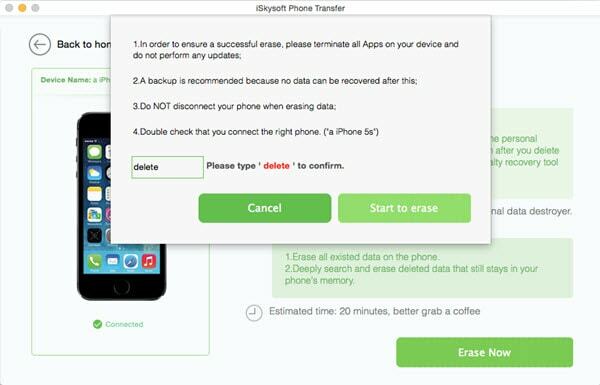 Permanently deleting your iPhone data won’t be a trouble anymore, with an efficient iPhone data eraser like iSkysoft Toolbox - Erase (iOS). 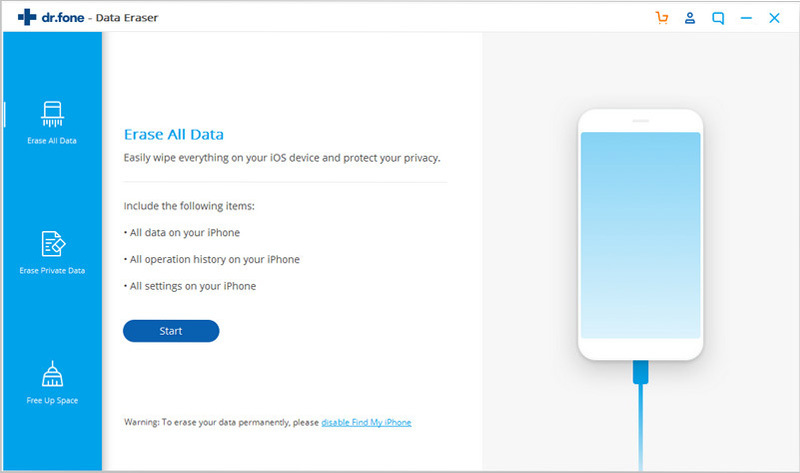 Using this software your data gets completely wiped out from the iPhone and prevents it from being leaked or misused. You can erase photos, reminders, call history, contacts, calendar, notes, text messages, etc. with this program.It makes sure that the data is 100% safe and unrecoverable, because of its read-only feature that doesn’t save or record any data. 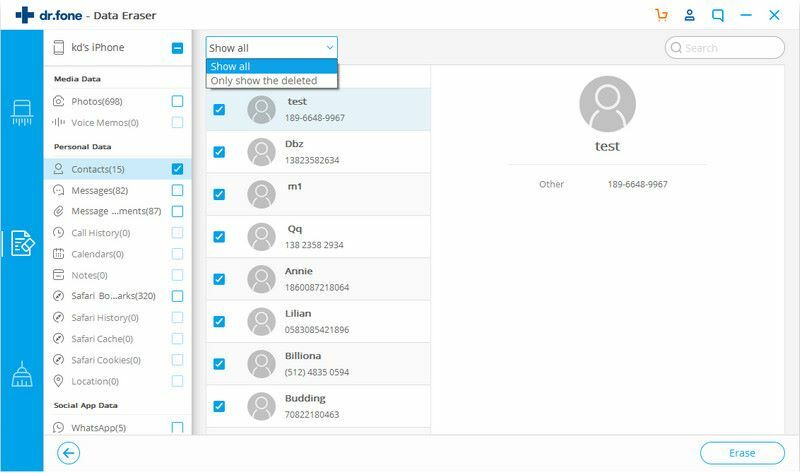 You can erase a wide variety of data with this tool and eradicates the chance of phishing, memory overload, junk files bulking up, data leakage, phone call crimes, and identity theft. You can use this iPhone data eraser to selectively delete data for ever and make it irrecoverable. It supports almost all iOS devices for deleting data permanently, including every iPhone, iPad and iPod Touch running from iOS 4 to iOS 11. As it doesn’t collect any data during scanning or deleting, you are assured about no recoverable residues being left over on your iPhone. You can use this software using a Windows or a Mac system, there is no limitation on it. Get the software installed on your PC and then launch it. Take a lightning cable and connect your iPhone to the computer. Here, you need to tap the ‘Erase’ tab on the iSkysoft interface. Then select the iPhone data erasing mode. It helps to erase all data, erase private data selectively, erase already deleted data, free up space and speed up iOS devices. 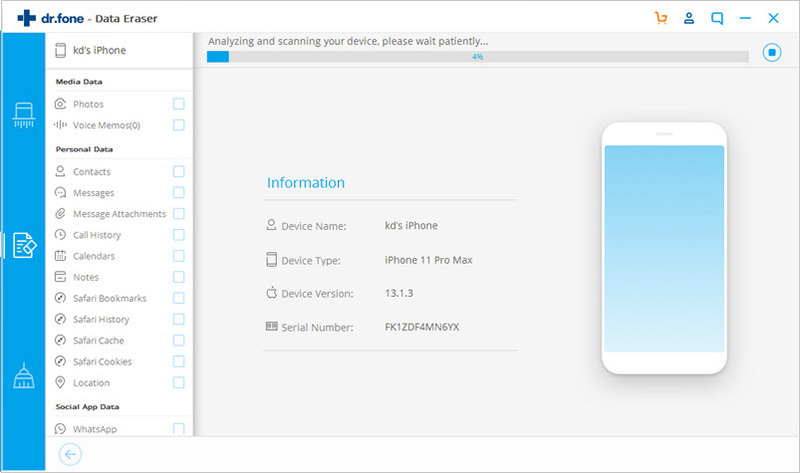 After connecting your iPhone, this will let the software detect your iPhone and then show you the device information as well. Step 2: Click the ‘Start Scan’ button to let iSkysoft Toolbox - Erase (iOS) scan your iPhone data. The scan data can be previewed easily, as it gets organized categorically. Now, click the checkbox against the desired data type(s), let’s say ‘Photos’ from the left side panel. Tap the ‘Erase from the Device’ consequently. When the popup appears, you need to enter ‘Delete’ in the text box and click the ‘Delete’ button afterwards. Step 3: Your target data will be completely deleted from your iPhone and you cannot recover it again. To avoid deleting important data, you might backup the data before erasing. While speaking of iPhone data erasers, this software shouldn’t be left alone. It can permanently erase phone data permanently. This amazing software is a safe option for transferring, restoring, and backing up your device data. 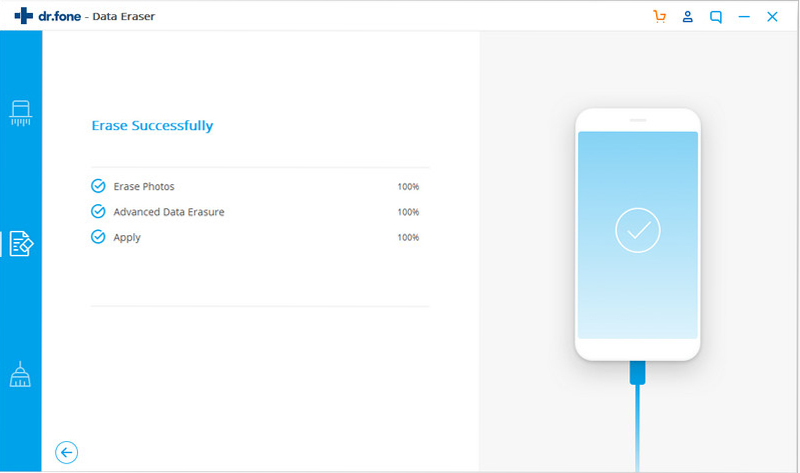 You can not only transfer data between mobile phones across platforms, but also backup the data to a computer. This even helps you restore your phone from different backups. It supports the latest Mac OS High Sierra as well. 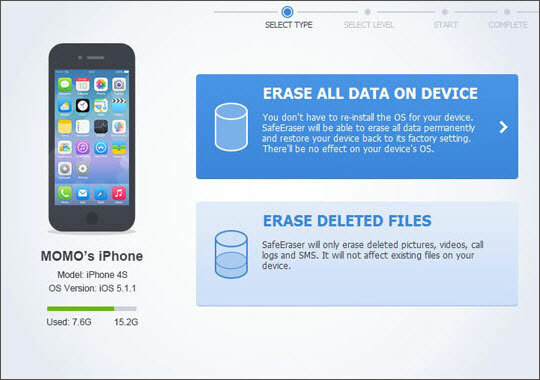 Erase chosen data on your iPhone. The erased data can't be recovered. Bonus: Transfer contacts, photos, media files, apps, calendar, call logs, SMS text messages between Android, iOS, Symbian, and Blackberry. Now, Apowersofte is another iPhone data erase software we are talking about today. Once files have been deleted using this eraser, they can never be recovered at all even if highly sophisticated technological gadgets are used to recover the files. The four modes for the iPhone Data erasers are the express clean-up, the complete clean mode, and the erase private data mode. 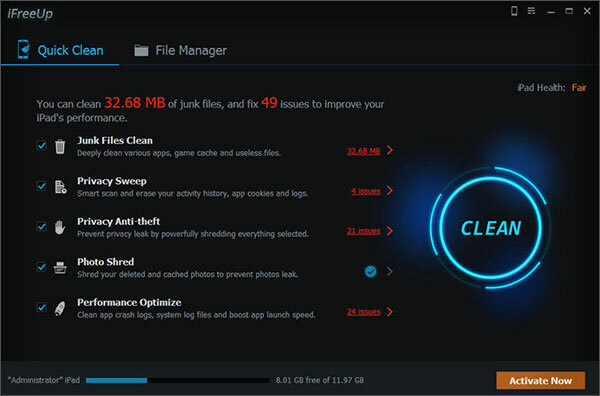 The erase private data mode is used to delete private information completely; express clean-up mode makes it possible in cleaning junk files available in your device while the complete clean mode is there to erase all available data as one turns the device to its original factory settings. The uniqueness of iPhone Data Cleaner app is that it supports all possible file formatting. The app allows cleaning of all the files in your iPhone such as photos, account passwords and even contacts. The users can clean up their devices with three dedicated erasing levels and four modes available for the app. Try the iPhone data erase software PhoneClean which allows its users to enjoy quicker, cleaner and better devices in many different ways. It has many unique features such as the ultimate speedup feature, in-depth privacy protection, the hands-free cleaning feature and many other innovative technological tools that make it a unique eraser. 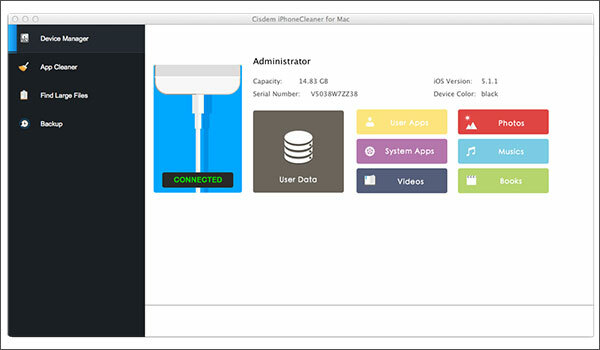 PhoneClean gives its users maximum security as it ensures all sensitive information is permanently deleted. This app also supports all files formats available as it ensures all security required is ensured. iShredder maintains international data security standards resembling a top-notch paper shredder machine. This program enables you for erasing private data like a military-grade based security system which erases unwanted files from your iPhone permanently. Using a 3 step file deletion process, this software overwrites empty space, following hack-proof patented security standards. With secure free space deletion, it also allows technical support through email. Advanced security program in this software maintain utmost privacy of data. Due to data destruction beyond redemption it ensures more success. Available in 4 editions such as Standard, Pro, Pro HD and Enterprise, this is an awesome iPhone data eraser. The enterprise edition has quality deletion algorithms. With iPhone Data Cleaner, you can effectively delete important files such as account passwords in 4 modes. It has 3 different levels for cleaning your iPhone data. The data is deleted forever without any chance of being recovered in future. Using the ‘Erase private data’ mode you can permanently delete private data, with ‘Express clean-up’ mode the junk files are wiped out, whereas the ‘Complete clean’ mode ensures that the entire data is removed from the device (take it back to factory settings). 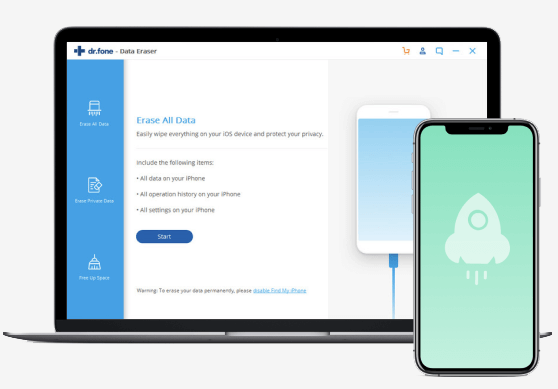 iPhone Data Cleaner software app helps you clean most files from your device, including phots, passwords, and contacts etc. This program supports a wide range of file formats and lets you delete your iPhone data in four different modes. Though, it can permanently delete your iPhone data, this eraser software consumes plenty of time while cleaning the data. iFreeUp is one of the reliable iPhone data eraser desktop applications having file management and data erasing features. You can delete log files, junk files, caches, and app log files using this program to release memory. It also helps you import, export, or deleted podcasts, media files, photos, and apps on your iPhone. it offers you different methods for releasing space on iPhone/other iOS devices without any data loss. The deep clean feature comes with a paid subscription. 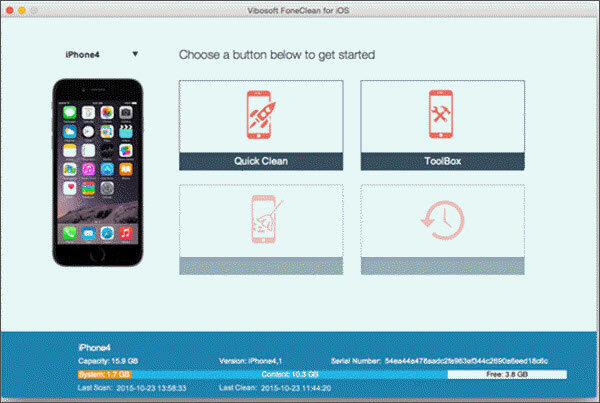 The free version of this software helps you to have a quick clean on iPhone or iPad, though with limited functionalities. It can boost your device performance by removing junk files, caches and log files with 1 simple click. Intuitive and user-friendly interface enables you to work comfortably throughout the exercise. 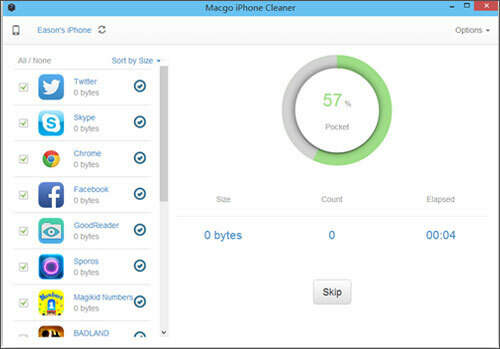 Macgo Free iPhone Cleaner is one of the iPhone data eraser desktop based software dedicated to protect your data privacy by completely deleting the data. 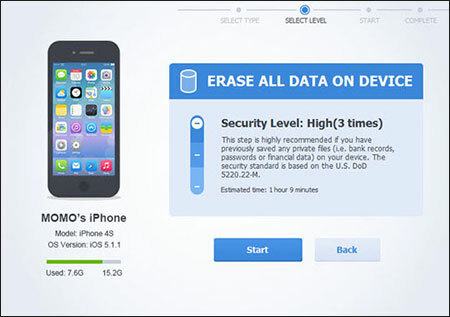 It can easily wipe out junk files from your iPhone, offering a secure means for erasing data. Top-notch analytics technology integration is a key player for this software. 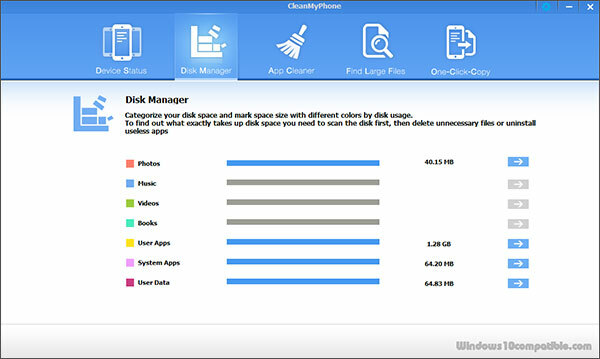 It reclaims your device storage space and has a customized app cleaning feature for enhanced efficiency. The only set back about this software is it takes too long to scan the iPhone and figure out the junk files. This software can delete all the junk files on your iPhone. It creates more space in your device for better performance. 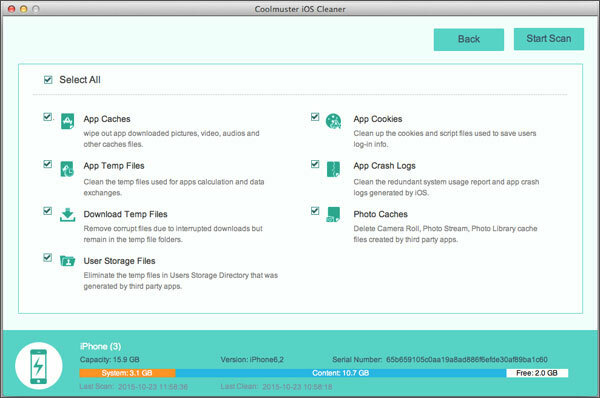 Coolmuster iOS Cleaner efficiently deleted different file formats from your iPhone. Like other iPhone data erasing softwares, this program makes the deleted data impossible to recovered. You can delete contacts, text messages, account information, media files, and passwords from your iPhone. It is essential to backup your data prior to deleting it permanently with this software. This software has an advanced data erasing process. The interface is very user-friendly and simple. It supports both Linux and Windows platforms. Vibosoft iPhone/iPad/iPod Data Eraser enables you to delete the last speck of data from your iPhone. any unimportant data including messages, videos, contacts, photos, account information, and passwords can be scanned and erased from your iPhone effortlessly. This software deletes files slowly compared to its counterparts. It comes with 3 different modes for destroying iPhone data for once and all. 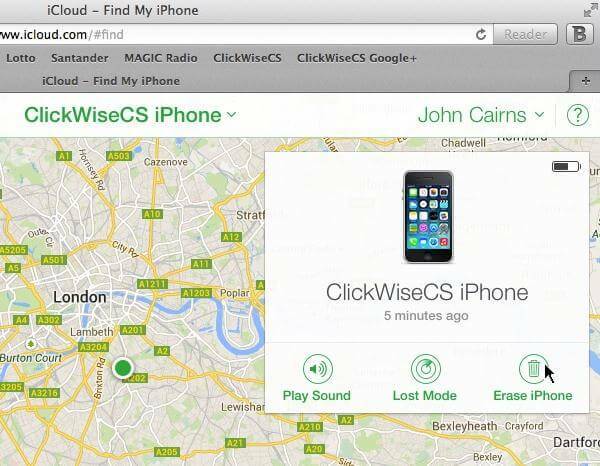 This software deletes everything from your iOS devices. You have 3 data erasing modes to delete your iPhone data, using this software. This program is very easy to operate and makes the data permanently irrecoverable. Cisdem iPhoneCleaner is one of the quickest iPhone data erasers that safely cleans and accelerates your iPhone within a minute. Your iPhone gets free from hidden temp, cache, and other junk files, as the software analyzes it faster, freeing up more space. It can delete 30 plus iOS file types and empty 75% memory space by erasing photos, recovering storage, managing and deleting apps, and fastening your iPhone like new. Apart from that you can also backup and restore an unresponsive/crashed iPhone. Complete data security is achieved through cleaning scripts and cookies, protecting privacy, and ensuring safety of private information. This software can empty your iPhone safely without any hassle. With just a single click you can back up your iOS device with this software. It supports almost all iOS devices and the recent iOS. CleanMyPhoneiPhone Cleaner is an iPhone data eraser software that not only cleans your iPhone by deleting unwanted day but enhances performance as well. It has a broad range of functional features to meet your various needs. Being one among the effective and safest private data protectors it eliminates unwanted data completely. You can also backup iPhone data using its One-Click-Copy feature. The data includes – camera roll, photo library, reminders, contacts, notes, music etc. backup of iPhone data in a single click is possible with this program. It can delete your iPhone personal data securely and permanently. Cleaning up the iOS System and boosting the device performance is tremendous. It can find out the large files quickly and clean up the disk space on your iPhone. Just deleting data from your iPhone device cannot remove data permanently. The data remains and may be retrieved by using data recovery software in the market today.These data eraser applications are what you need to erase all private and sensitive data permanently that you don’t want to be exposed to other people. Erased data is not recoverable at all.